Yes, you can whip up fresh tomato salsa in minutes, but with just a little extra effort, you can enjoy the rich, smoky flavor of roasted tomato salsa. Want to kick the flavor up a notch? Roast jalapeño along with the tomatoes for a sweet-and-smoky pepper that’s less spicy than raw jalapeño. Pro tip: For a spicier salsa, add one or two additional jalapenos. 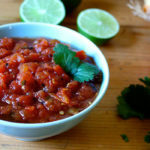 This rich, smoky roasted tomato salsa can be made in minutes featuring chopped cilantro, fresh lime juice, garlic, onion, and fiery jalapeño peppers. Place tomatoes cut side up on a baking sheet. Add onion, garlic, and jalapeno. Season with salt. Bake for 20 minutes, turning after 10 minutes, until soft. Cool for 10 minutes. Place roasted vegetables in blender or food processor; cover. Blend until slightly chunky. Add lime juice; blend to desired consistency. Place salsa in a medium bowl. Add cilantro; mix well. A great veggie-based “freebie” accessory.